The word Handmade is found on many art knives. 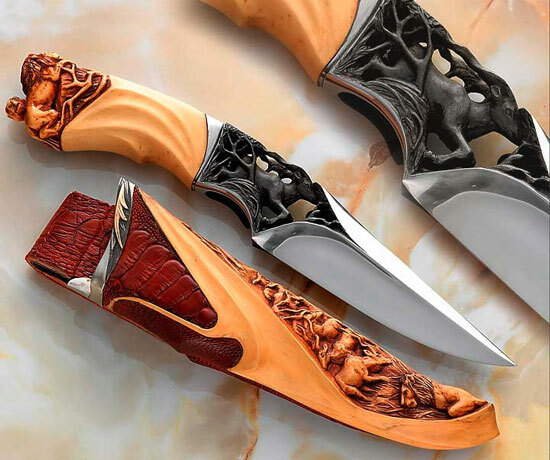 In my opinion, the most handmade art knife today is that of Arpad Bojtos. His shop consists of no machines, just files, carving tools, and sand paper. His artistry is unsurpassed. At seven or so knives a year, only one or two appear for sale on the web each year. Study the story of the chase carved into the Boxwood handle. The furnishings are of Silver, steel, and Gold. This species of a rare Box Wood is used for violin construction and in finely-carved chess set pieces. Bolster/Guard : ATS 34 of Gazelle & foliage. Silver spacer.